What's the number one scariest threat to many RVers? It's not driving a massive coach down tiny roads. It's not backing up a fifth wheel trailer into a tough spot. It's not even dumping the black tank (which really isn't so bad). Water damage is way scarier. 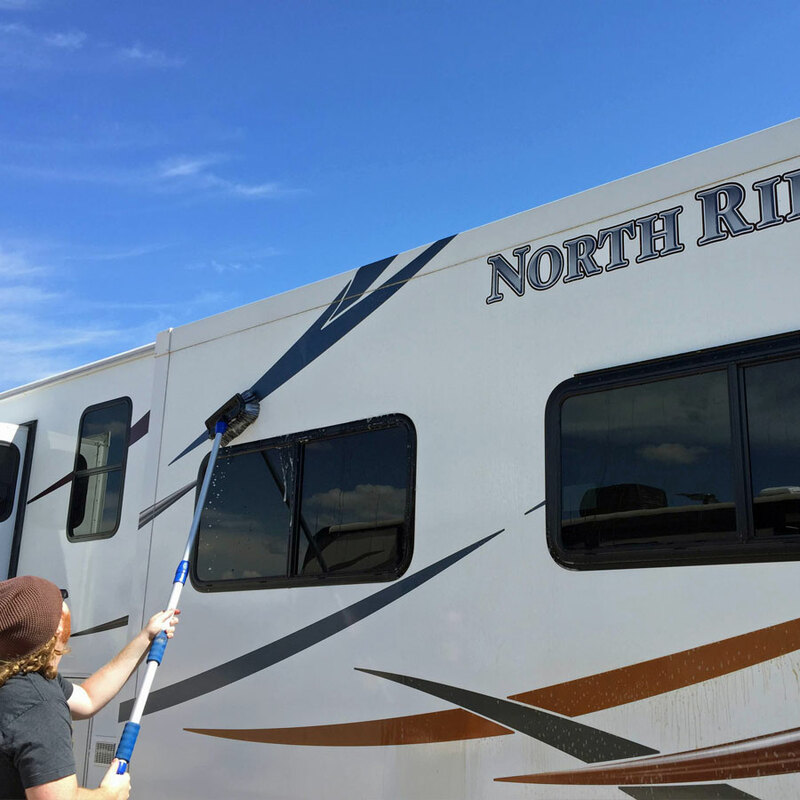 It might not sound so bad, but when water seeps into even the tiniest cracks in an RV's ceiling, walls or windows, it can cause major problems. Mold can set in. Entire walls can rot away, and the floor can buckle. Repairing the damage can mean spending big bucks, rebuilding parts of a rig, or buying a new RV altogether. How do RVers prevent water damage? By performing regular check-ups and recaulking as needed. 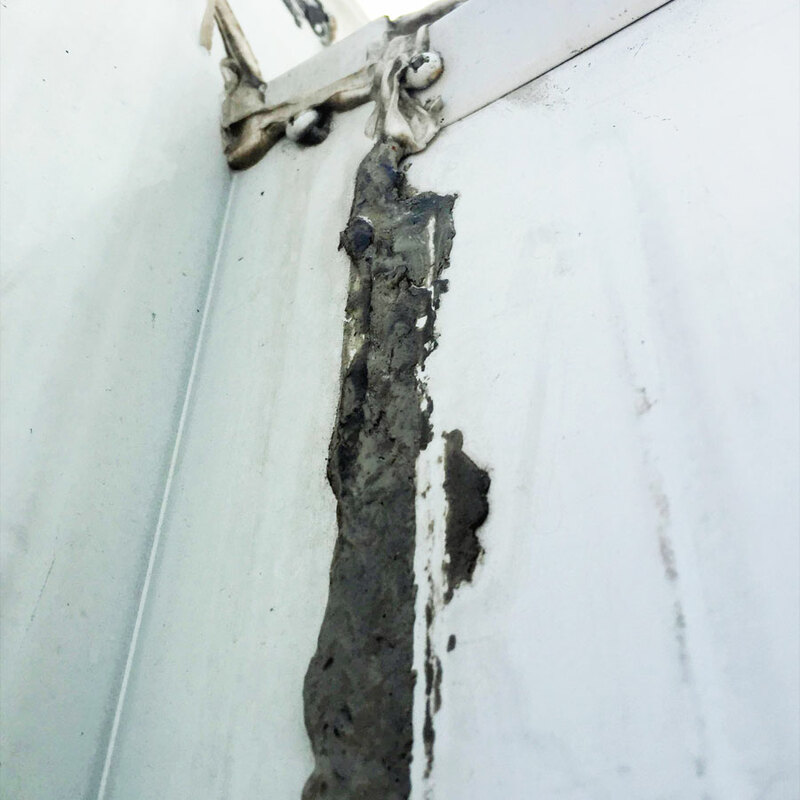 We try to keep a constant eye on the state of our rig's caulking, but in actuality, we look over the roof, slides and seams every 3-6 months. 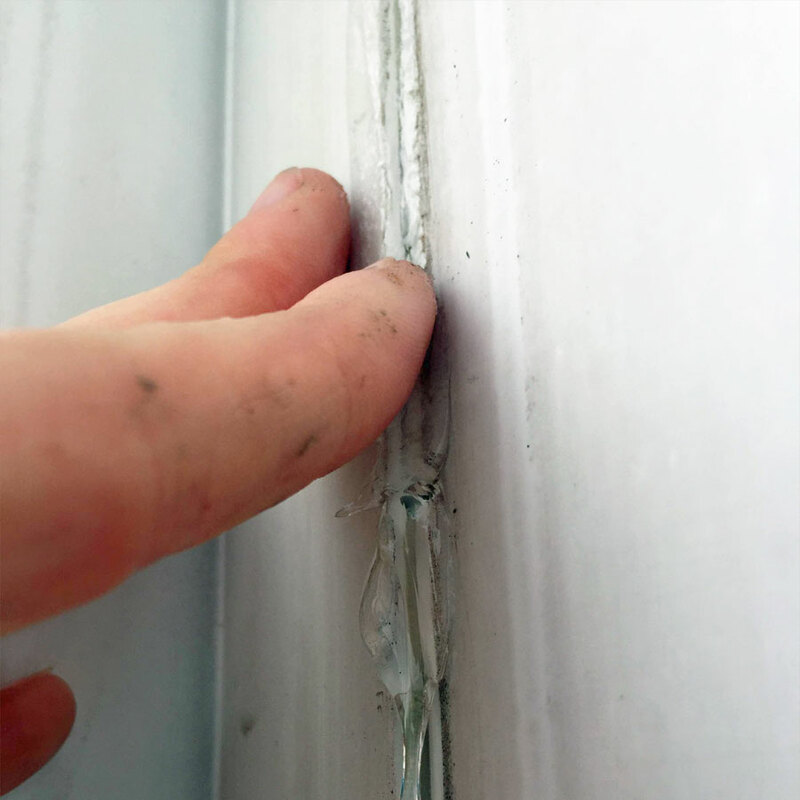 When you see cracking putty or caulking, you should know that it's time to replace that section. 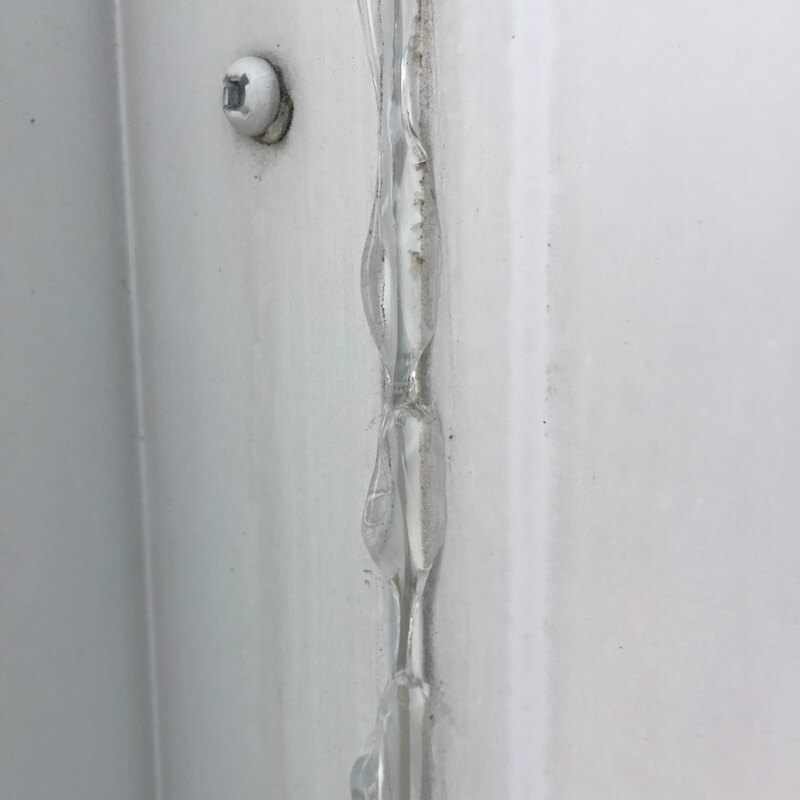 Even worse, when you see that the old caulking is all but gone, you definitely need to replace it. Look everywhere there is a seam, like at the corner of your slide-outs, where the air conditioner and ceiling vents come out of the roof, at the windows, etc. When it's time to caulk, the first thing you'll want to do is check the weather forecast. Don't get started on this project when you're about to have a week of storms. You want the weather to be clear for several days. Next, it's a good idea to wash your rig to get rid of road grime and dead bugs. If you know you're having problems with water leaking, though, avoid getting these areas wet. Then set aside some hours and maybe even recruit a friend to help, because the next steps are time consuming. 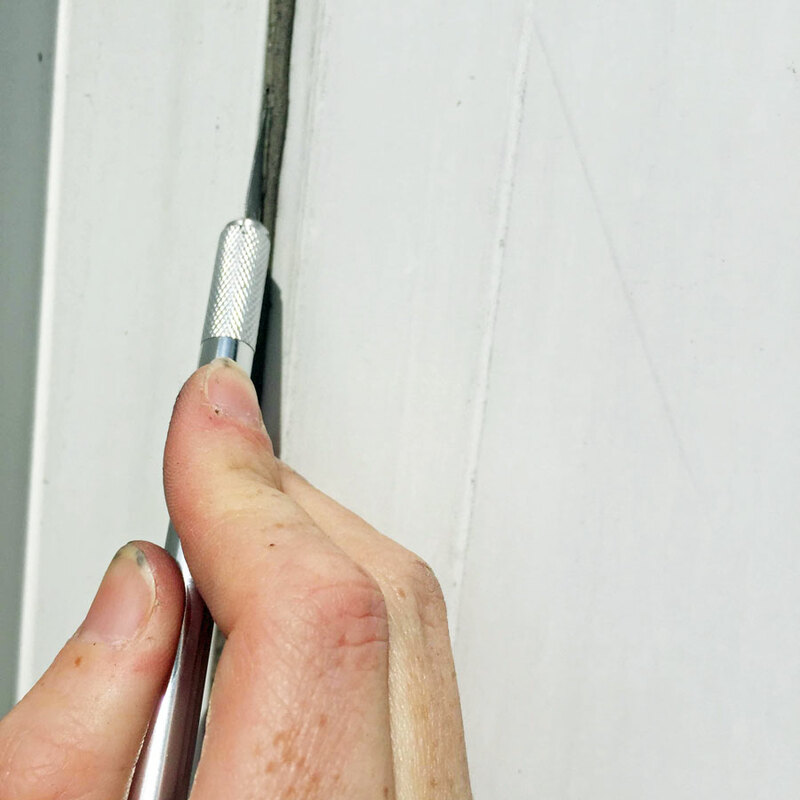 You'll be removing the old caulking and applying new caulking before it rains. Ideally, you'll do this in a day. To start your project, you'll first need to get rid of the old caulking. Here's what it looked like our rig. Carefully cut along the caulking, and it should strip away fairly easily. If you're removing silicone caulking rather than putty, this is going to take some more elbow grease. Use a carpet blade or X-ACTO knife, but don't cut into the siding. If residue remains, clean it up with denatured alcohol, using a rag to scrub if necessary. 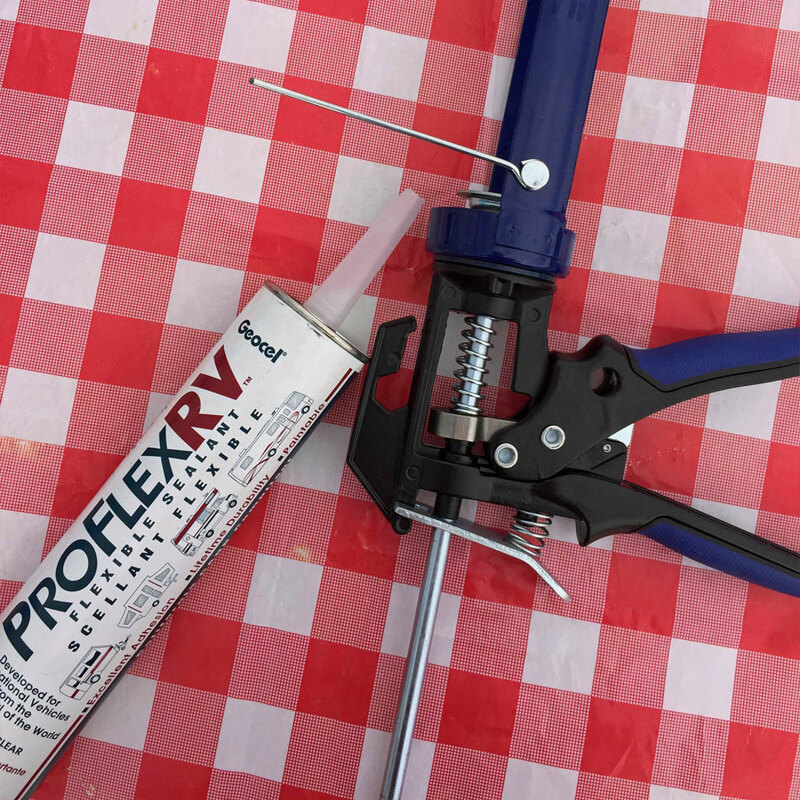 I bought ProFlexRV caulk at Camping World, but I bypassed the store's caulk gun, as it doesn't have a couple of features I like. Instead, I headed to Lowe's and picked up a caulking gun with a snipping hole and puncture tool. When I was ready to start caulking, I cut off the end of the caulk tube nozzle with the snipping hole in the gun. You can control how much you cut off, which changes the thickness of the caulk line. The next step is the point of no return, as once you puncture the inside seal of the caulk tube, you have to use up the tube or throw it away. Using the puncture tool, I opened up the tube, placed it in the gun's cradle, and got to work. If your caulk gun doesn't have a tool like this, you can use a long nail. Start by caulking a bead along your first seam about 4-6 inches long to get a feel for it. 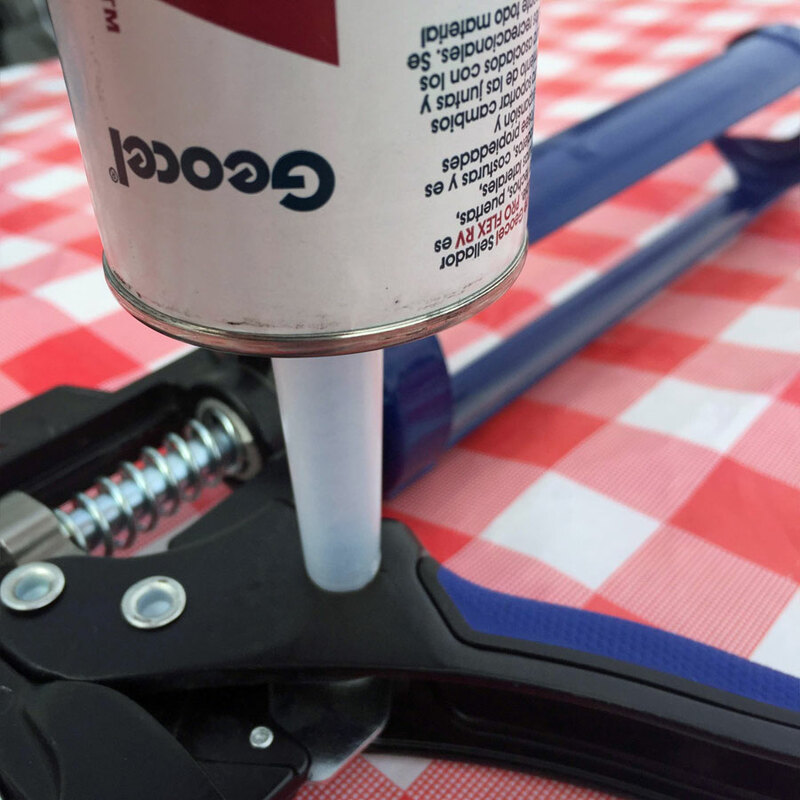 When you set down your caulk gun, press the silver thumb trigger in the back to take the pressure of the caulk so it doesn't continue to squeeze out of the tube. It doesn't have to be perfect; you'll get the hang of it. In the next step, you'll see how forgiving this process can be. Take your cup and fill it with water or soapy water. Dip your fingers in the water and drag them along the bead of caulking to smooth it out. This will make an even seal over the seam. You can use tools for this, but I prefer having control with my hands. Continue the process by piping on more caulk and smoothing it out over all the seams. This is a tiresome task, and your arms will probably be screaming for relief by the end of the day, but you'll rest easy knowing that your rig is much more resistant to leaks and floods. How many tubes do I need? That depends on how much of your rig needs caulking and the size of your RV. Our three slide-outs took two tubes of caulk. How often do I need to do this? I've heard some people say twice a year, and others say every few years. 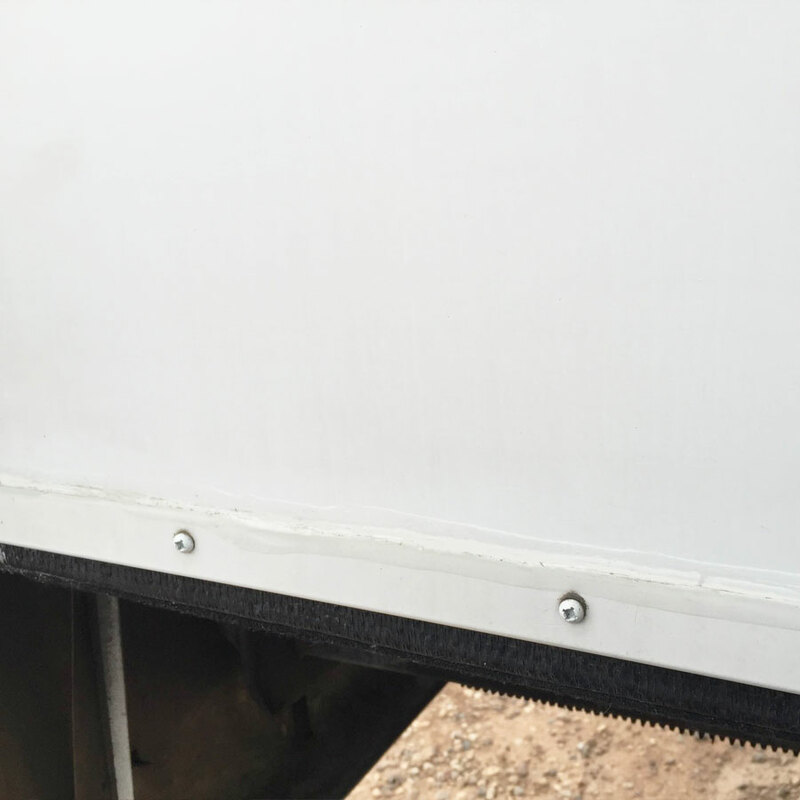 The answer depends on the elements your RV is exposed to and the type of caulk you use. Just make sure to check your seals often and replace the caulk when it needs replacing. What about rain? Read the instructions on your caulking tube to see how long it needs to set before it can get wet. What kind of caulk do I get again? That depends on the material your RV is made out of. If you have a rubber roof, do not use caulk meant for vinyl roofs, as it will damage your roof. Also, remember that self-leveling caulk will spread out as it cures, so this is not appropriate for non-flat surfaces. Read instructions and ask for help if you need it. Have you recaulked your rig before? Did you take any additional steps? How did the process go?